EA Group supply, install and maintain Automatic and Manual Revolving Doors, Curved Sliding Doors and Sliding Doors in the Egham area. Our automatic and revolving door clients in the Egham or TW20 postcode area do vary, but typically our customers include office buildings, commercial business premises, leisure and sports facilities, retail outlets, architects, construction companies, building contractors and local government. Through continued development with architects and designers, we offer our revolving doors in a choice of design styles. They can either be constructed almost entirely from glass, with only stainless steel patch fixings to secure the glass panels together. Or with a thin edging frame, offered in choices of polished or brushed stainless steel, brass or bronze finishes, or PPC to match any RAL colour. Our in house team will visit any premises in Egham or TW20 postcode area and carry out an in-depth site survey to then be able to discuss and offer an automatic or revolving door solution that is suitable for the application. By having a revolving door system fitted, you will be dramatically improving the energy efficiency of your property in Egham as they control the airflow at an entrance area more effectively than other door systems. EA Group have years of experience and expertise that will ensure that your automatic or revolving door will be planned and installed correctly, on-time and on budget by professionals. All automatic doors from the EA Group range are CE marked and are built to meet the requirements of BS EN16005 safety regulations. 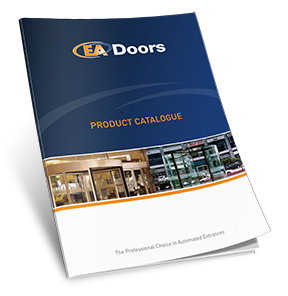 Our EA All Glass Revolving Doors are designed and manufactured in Great Britain, which enables us to have the quickest possible lead-times and reduces the carbon footprint of delivery from our UK production facility to your site in Egham. We can also manufacture our EA All Glass Revolving Doors to specific sizes in both width and height at no additional cost (unlike most other brands). Furthermore, you can choose from powder coated, polished or brushed stainless steel, bronze and others finishes. Optionally, you can choose to have one of our UK manufactured manual revolving door speed controllers fitted, which restricts the speed of the door revolution. It is our company reputation in Egham that has ensured our name has been passed on as the company to speak to for automatic door and revolving door systems, installations and service. You may well have arrived here on our website from someone referring us to you. Even if you already have an automatic or revolving door system fitted to your property in Egham or the TW20 postcode area by another door company but would prefer a higher level of response and service, please get in contact with us as we would be delighted to discuss the opportunity to service and maintain your existing system. All of our clients are important to us and we pride ourselves on our professional knowledge and workmanship with all of our automatic and revolving door installations not just in Egham but nationally. As the revolving door specialists in Egham we are your automatic choice to install, repair or maintain your entrance system to a high standard, ensuring that it is reliable and problem free. If you are considering having an automatic door, revolving door or curved sliding door installed in Egham or the surrounding TW20 postcode area, or if you wish to have your existing system repaired or serviced, please contact us for a friendly, no obligation chat and arrange a survey.